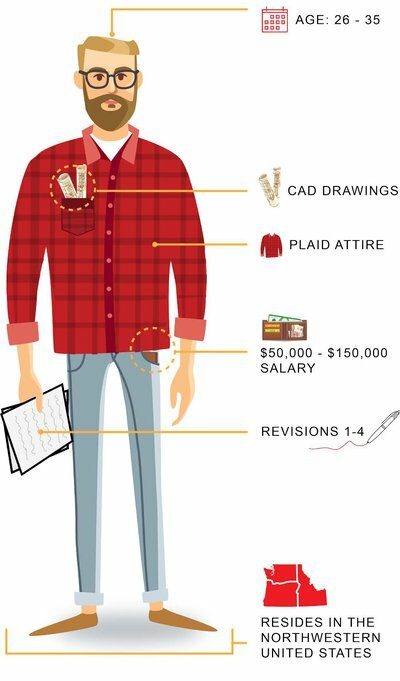 Josh is a plaid-wearing professional in Boise, Idaho, both in that he works professionally and that he’s really good at wearing plaid. He’s been a Navy Communications Officer, a Company Commander and an Assistant Public Works Officer. Now, he’s a writer and marketer, a micro business owner in product design, and a man of all trades. Josh is an electrical engineer. Day to day, his work varies. He’s writing technical articles, reviewing schematics, designing hardware projects and attempting to explain the 3D printer to his less technically inclined coworkers. In his free time, Josh is a maker, working to develop products and ideas that address his many passions. Josh works in the northwestern region of the United States, along with 11.91% of engineers surveyed in a study by Advanced Assembly. His fellow engineers are in the northeast (15.32%), the southwest (14.04%) the southeast (8.94%), central region (15.04%), and Canada (2.84%). Unsurprisingly, 31.91% of respondents reside elsewhere. While Josh falls within the 26-35 age range with nearly 19% of respondents, the under 45 category accounts for a total percentage of only 49.64%, with those over the age of 46 accounting for the remaining 50.35%. Most engineers surveyed have, like Josh, been at their job for between one and five years. They’re coming from small companies who employ between one and five engineers. Of course, some respondents are working for companies that employ 20, 40, and even 1,000 people. Their income varies greatly, ranging from around $50,000 to upwards of $150,000, which may reflect the fact that they’re working at companies of different sizes, are geographically varied, and have a variety of job experience. For Josh, the longest part of PCB design is the initial design—but what feels the longest is the debugging process. There’s a sense of excitement in the initial phases, a momentum created in the making of something new. Debugging can be tedious and wear the initial enthusiasm thin, though Josh admits that a properly working board offers significant reward. Data suggests that Josh is not alone—nearly 34% of surveyed engineers believe that the most work goes into the design process, followed closely by debugging. Others work harder in the scoping, manufacturing, and prototyping stage. Within the prototyping stage, almost 27% of engineers find changing job requirements to cause the most headaches, though the purchasing of parts and boards, budgetary restrictions and looming deadlines are also stress inducers. Interestingly, few engineers (11.86%) have trouble finding a quality manufacturer and assembler. And it is no surprise that the design process is the most tedious—32.71% of engineers revise around three times, though most all fall under five. In a perfect world, second revisions are production ready. In reality, three to five revisions are needed to get to production. Lower numbers might represent engineers who are building less expensive boards with parts that can be easily changed out (jumpers, etc.). However, for small consumer items produced in the millions, revisions are very necessary. The majority of engineers are designing with fewer parts, between one and 25, with the number of engineers becoming incrementally smaller as the number of parts increases. There are likely a number of reasons for this, including breadth of work being performed. 25 boards, and an extremely small percentage need over 100. It probably comes as no surprise that the overwhelming majority of engineers would like communication with PCB assembly vendors via email, though a small number prefer telephone or video conferencing. Choosing which assembly house to partner with can be quite a struggle though. For Josh, it can depend on the board. For simple boards, cost is the primary consideration. For complex boards, he rates speed, communication, and trust as the most important factors. Josh identifies some crucial characteristics of the types of assembly houses engineers want to engage with. Among those surveyed, on time delivery was most desired, followed closely by clear and consistent communication. Contact in case of problems and flexibility of price also ranked highly. Of the engineers surveyed, most were actually relying on hand assembly at their company (59.78%). The second highest number of responding engineers reported that their boards were assembled at a local assembly shop. Finally, equal numbers (around 10%) used their company’s own machine assembly line or sought the help of a large contract manufacturer. Engineers, Josh included, are hungry for information, and they’re particularly interested in PCB design tips, current technologies, new markets and economic trends. Of the engineers surveyed, around 35% said that they aren’t using any technology this year that they weren’t using last year—a surprising number in an industry that experiences such growth and change. Of course, many are also taking advantage of new CAD programs, 3D printers, mobile and web based tools, microtechnology and CNC. As for Josh, he’s using a new 3D CAD tool for enclosures. And Josh’s own enclosure? Like many engineers, it is an office within an office, a place intermittently buzzing with conversation and quiet. Amidst the tap tap of fingers on keys, one hears the zzzzzzzthurp! of a 3D printer, gradually constructing the cookie cutter Josh designed for his wife. While Josh and those surveyed represent some electrical engineers, they are but 905 members of a much larger, varied community of professionals. All, some, or none of the data represented may be reflective of the experience of any given electrical engineer.